(Newser) – Two conservative media giants are combining forces. Glenn Beck and Mark Levin are merging TheBlaze and CRTV to create what the Hollywood Reporter calls a "conservative media powerhouse." 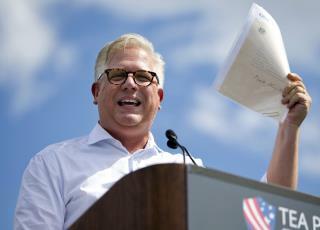 Beck founded TheBlaze after exiting Fox News, while Levin, a former attorney in Ronald Reagan's administration and nationally syndicated radio host, founded LevinTV, which ultimately became CRTV ("Conservative Review" TV). CNN notes that the two media entities have been competitors for years, both offering on-demand video libraries with content from conservative contributors (among CRTV's stable: Michelle Malkin and Duck Dynasty's Phil Robertson) and websites featuring conservative news and commentary; it paints the merger as "one of the most sizable consolidations to ever take place in right-wing media." All of the above listed are the same as the national enquirer,full of B.S.! N.E.= Elvis visited us in a spaceship! Fox & those others= trump is doing good for America! Same B.S. just different spellings!